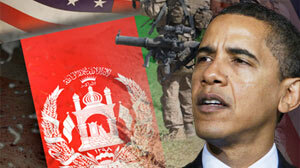 Drop for Obama on Afghanistan; Few See a Clear Plan for the War. Barack Obama's ratings for handling the war in Afghanistan have dropped sharply, with Americans by 2-1 saying he lacks a clear plan there. But the public itself is divided on how to proceed, torn between the difficulties of the war and the threat of Taliban or al Qaeda-backed terrorism. Forty-five percent now approve of the president's handling of the situation, down by 10 points in a month, 15 points since August and 18 points from its peak last spring. His approval rating on Afghanistan has fallen farther than on any other issue in ABC News/Washington Post polls this year. The chief reason for the latest shift is the departure of Republicans: Last month, after his August speech calling it "a war of necessity," 51 percent of Republicans approved of how Obama was handling Afghanistan. Now, with his strategy review underway, just 22 percent still do. That shift describes the political box in which the president finds himself. If he sends more troops to Afghanistan he risks losing support from Democrats, who are far more skeptical of the war; if not, he risks alienating Republicans and a substantial share of independents. Underscoring the divisions, 47 percent of Americans say the war has not been worth fighting, essentially steady since summer, with vast partisan and ideological gaps. The public similarly divides on whether the president should accede to the military's request for perhaps 40,000 additional forces: Forty-seven percent think so, 49 percent not, again with sharp political divisions. One concern: Thirty-five percent now see a Vietnam-like entanglement for the United States in Afghanistan – still well under half, but double the number who said so early in the war, in March 2002. Meantime, there's 2-1 agreement – negatively – in views on Obama's strategy. Just 31 percent think he has a clear plan for dealing with the situation, while 63 percent think not. Even in his own base, among Democrats, just 44 percent say the president has a clear plan; that falls to 31 percent among independents and just 12 percent among Republicans. There's also agreement on another front: Two-thirds of Americans think there was widespread fraud in this summer's presidential election in Afghanistan. A runoff was scheduled yesterday, to be held Nov. 7. GOALS – Afghanistan's not an easy issue; doubt about the war is countered by deep antipathy toward the Taliban and al Qaeda. Indeed "preventing the Taliban from returning to power" receives equal emphasis in public opinion as "preventing the establishment of al Qaeda terrorist bases"; 75 percent say both should be done by the United States, and two-thirds say both should receive "a high priority." Fewer, but still 53 percent, give a high priority to attacking leaders of the Taliban, al Qaeda and similar groups across the border in Pakistan; substantially fewer still, 33 and 38 percent, respectively, give a high priority to providing economic aid or establishing a stable democratic government in Afghanistan. Most, though, do say these should be done, if not as a high priority. Testing the notion of a shift from counter-insurgency to counter-terrorism, this poll also asked if the United States should allow elements of the Taliban to regain power in Afghanistan if it determined that they do not support terrorism against the United States. Seventy-nine percent oppose the idea, further marking the deep suspicion with which Americans see the Taliban. The perceived threat is a major element of support for the war and for the deployment of additional troops; both of these soar among people who see deterring the Taliban and al Qaeda as high priorities for the United States. GROUPS and MOVABILITY – Views that the war's been worth fighting range from 71 percent among Republicans and 58 percent among conservatives to 36 percent among Democrats and 32 percent among liberals. Similarly, 69 percent of Republicans and 59 percent of conservatives favor sending more U.S. forces; among Democrats and liberals, 34 and 29 percent, respectively, agree. There are divisions among other groups as well. Men, for example, are far more apt than women to support spending more troops, 56 percent vs. 39 percent; and it's 52 percent among people over age 30, compared with 28 percent of younger adults. Attitudes, it should be noted, are movable. Support for sending additional U.S. forces is higher in this poll, with a support/oppose question noting that the military leadership has requested them, than in questions instead asking if the U.S. troop levels should be increased, decreased or kept the same. Also, while 33 percent "strongly" support sending more troops, and 38 percent strongly oppose it, that leaves a substantial group without strong feelings on the subject. As to Obama, approval of his handling of the situation is nearly three times higher among people who think he has a clear plan. All these point to likely strategies in marshalling public opinion: For supporters of increasing the troop deployment, the argument that it's needed to deter al Qaeda and the Taliban; to opponents, the opposite; and for the administration, the need to present a clear and persuasive strategy.